Robert Samuel Miller of Clashvalley Dunbeath died 5th August 1966 aged 91. 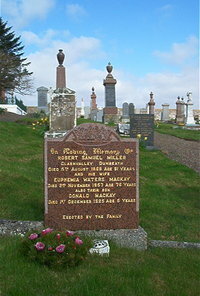 Wife Euphemia Waters Mackay died 2nd November 1957 aged 76. Son Donald Mackay died 1st December 1925 aged 5.